Irish Garden House: Grand Happening . . .
Grand Happening . . .
Another baby shower . . . baby almost here . . . second great grand for me . . .
My daughter and I took off for Grand Rapids in a Lakeshore snowstorm . . . treacherous. . .
We had the chicken salad, croissants, flowers, homemade mobile . . . So we had to be there . . .
We were headed to my daughter in laws, mother's home . . . for the shower. "bring the shower to her" so she could enjoy the day with us all. What a joy it was to see Joyce enjoy the day . . . lots of laughter about the "days of old!" Thank you to Sue's friend Brenda who kept the stories rolling . . . 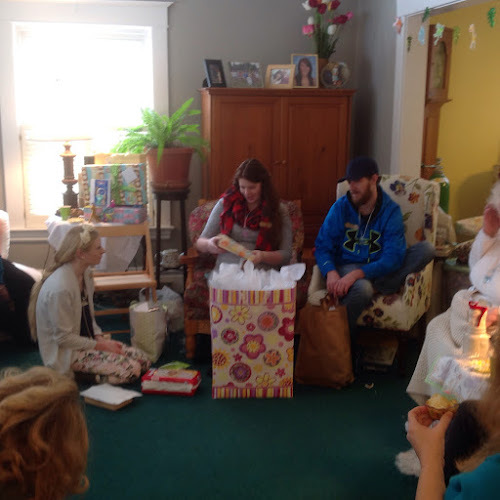 This truly was a day of family/friend togetherness and love . . .
Three great grannies in this mix . 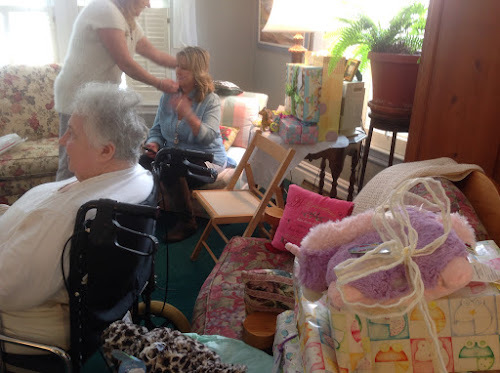 . .
Great Granny Joyce, GG Lynne and GG Roberta . . . Along with the grannies, there were aunts, sisters, cousins, grand babies and friends . . . and . . . 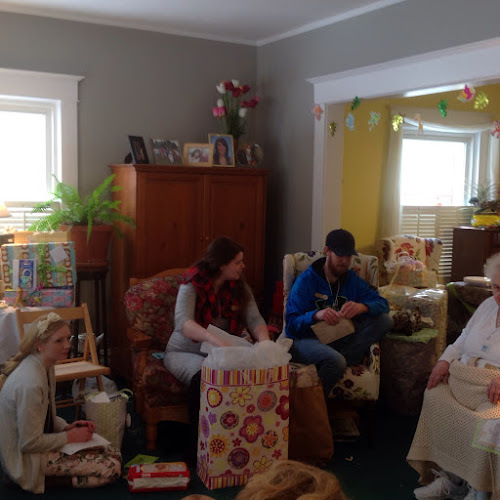 Mother Sue, (DIL) of grandson Cody, soon to be daddy, Lori, mother of Elise . . . soon to be momma . . .
expecting their first . . due . . any . . day . . little one . . . I mention the above because DIL created the gathering . . .
some knowing one another, others complete strangers. Sue plans kept in mind Elise . . . and Cody . . . and the excitement of their little blessing . . .
as she planned their shower party . 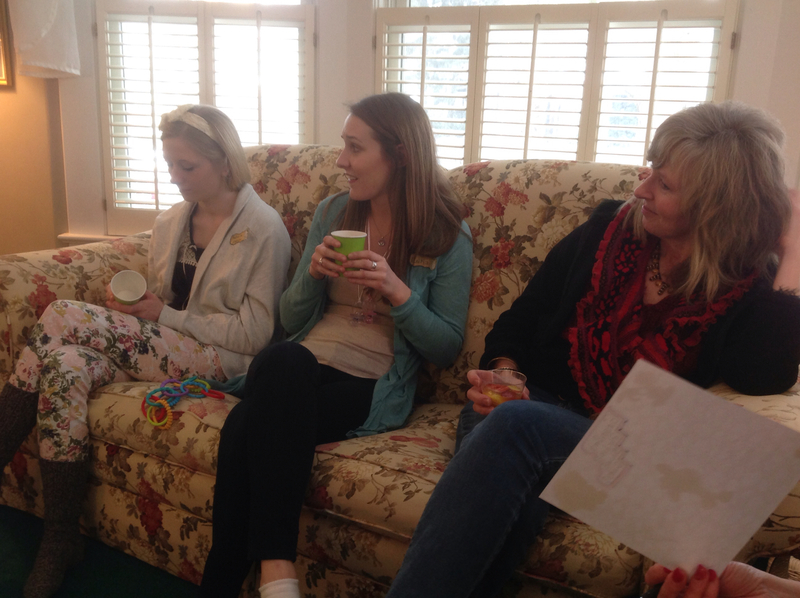 . .
She put her "filled up life" on hold and created a relaxing, unified, loving gathering . . . for all . . .
very nice Sue . . . indeed . 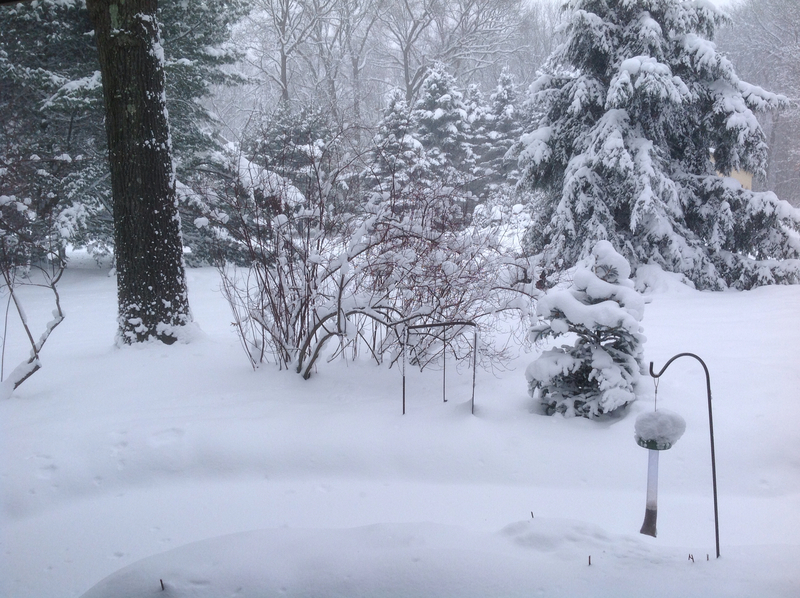 . .
A wonderful snowy day . . . traveling carefully . . . Happy everyone made it home safe and sound . . .
One more mention . . . 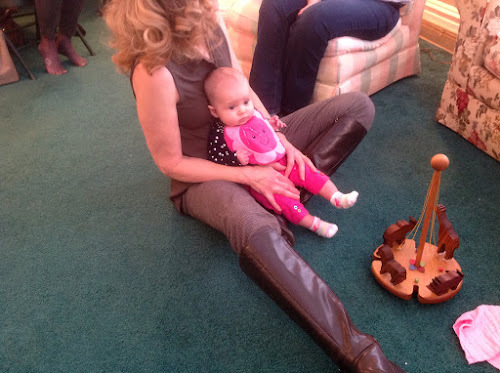 The Merry Go Round in wood, on the floor, near the baby, was made by Sue's dad twenty plus years ago. He made one for each of the oldest of his (and Joyce's) grandchildren . . . I count that he made five of these treasures . . .
Twirl it up and it goes round and round and round . . . twirl it up again . . . round and round . . .
Life does that, doesn't it . . .
What a lovely day you must have had surrounded by family and friends. It looks like a really lovely day...indoors, that is. Sounds like a very sweet hostess. Many congratulations and hopes for an easy and uneventful delivery of their little one. 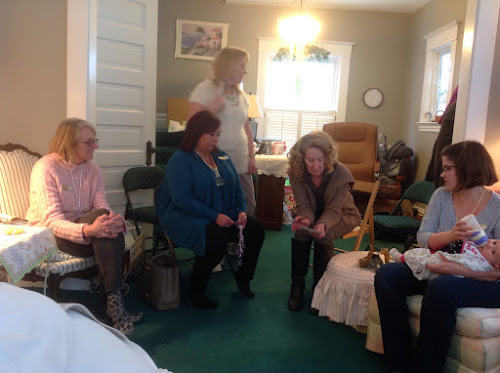 Hello Lynne, the baby shower looks like a success considering the snowstorm. 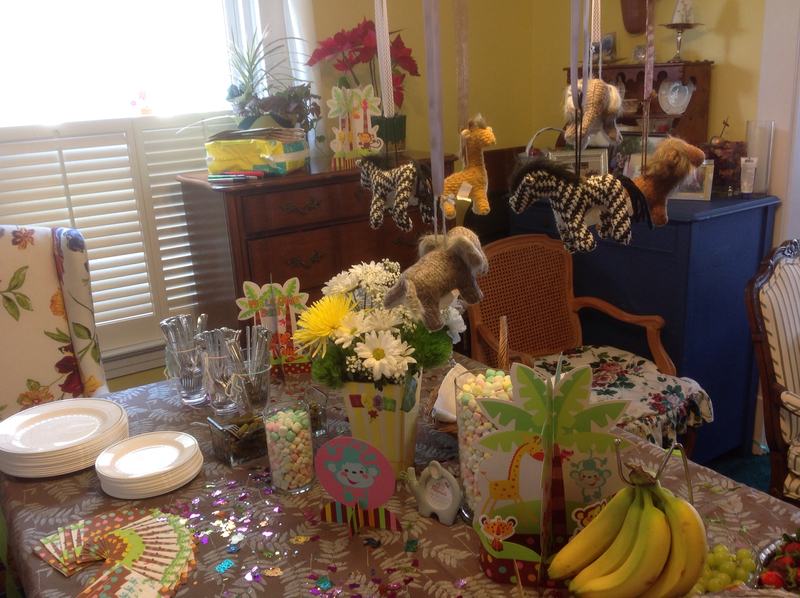 Everything looks beautiful Lots of yummy food and treats and gifts too. Congrats on the great-grand #2. Happy Tuesday, enjoy your new week! What a nice shower. Just what showers should be, family, friends and babies. I love the merry-go-round. Wish I had one!! Something to while away my hours on these cold, snowy days. My best to the mom and babe. My goodness, what a lovely shower and so well attended too! I love that spinning merry go round with the little wooden animals... it is truly a work of art!! So glad that you were able to get to the shower and home again without any incident. Travel this time of year is sketchy, at best. I'm glad you had a safe journey and enjoyed the lovely baby shower. The cupcakes look so pretty and I love the merry go round toy. How Perfect the gathering. So much love and care. Best wishes to all! What a lovely idea...and a lovely day! 2 greats for you....aren't you the lucky gal! Three GG's together, how wonderful! It was nice that they brought the shower to her house. To bad the snow kind of hampered the driving for everyone. It looks pretty but you can keep it on that side of the lake! Congrats on becoming a great grandma again! Can't wait for pictures when the baby arrives! Babies are wonderful! Congratulations to all. I am a great aunt times two with great niece number three on the way in June! :) I can't wait either! It looks like a lovely shower! Best wishes to the new parents and all the family! Glad everyone made it safe and sound in the snowy weather. Take care! 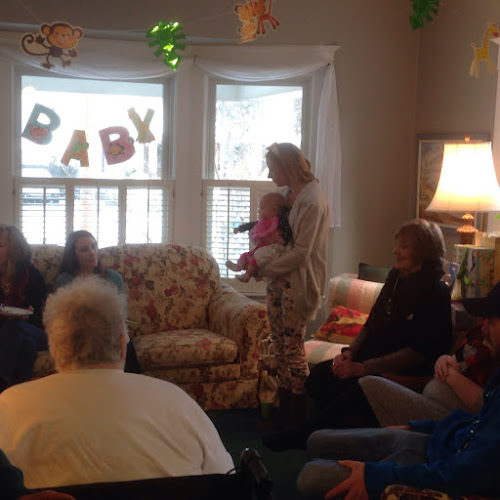 That looks like the BEST sort of gathering!....Congratulations on another great-grandchild! 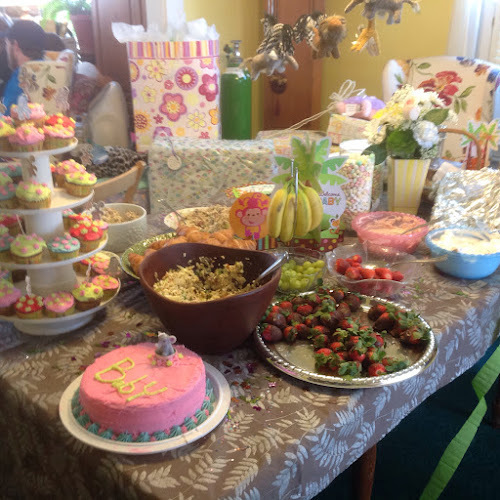 what a lovely baby shower! dropping by via eileen's to say hi. Have a wonderful rest of the week, Lynne. The weather has been funky and I'm glad you made it safely! What a delightful looking party -- lots of joy, lots of fun and oh, the cupcakes look to die for! Fun day. Glad you made it there and back safely. 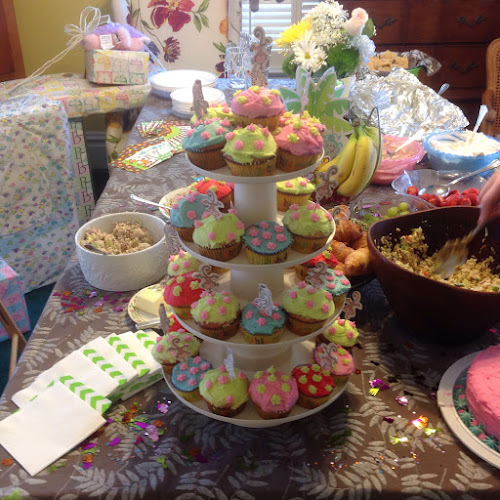 What a lovely, memorable and perfect celebration for the pending arrival of a new family member! The merry-go-round is a true treasure! I'm getting caught up on blog reading. What a special shower. Crazy weather and all! Another lovely day in the life of Lynne of the Irish Garden House. You are a blessed woman. That wooden carousel if enchanting. I love it!